I recently took the opportunity to record some power numbers on the drafting advantage while cycling in a small group on a brevet in southern Scotland. 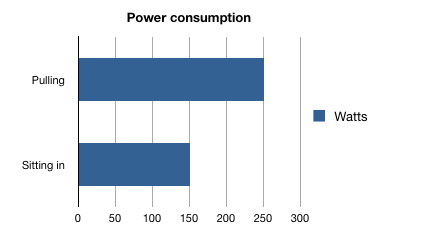 Because I already have good power figures for my racer (via PowerTap hub) on the flat in calm conditions, it was a neat contrast to do the same on a real road, with a headwind, as part of a group. Although the conditions were not controlled (the road was rolling and the wind wasn’t constant – neither was the speed or effort of the group), it was a steady enough effort that I feel confident presenting it here. Average speed for the leg was ~18mph. The headline figure is that riding at the head of the line cost about 100W more than sitting in (i.e. 250W versus 150W). Drafting is a huge advantage when cycling! For contrast, riding solo in lab conditions on the flat, I get 16.5mph at 150W and 19.5mph at 250W. From simple physics, if a climb can be done at 10mph at 150W, 250W means climbing at 16.5mph. A huge difference. Riding in a group of four drops it right down to 630kcal – or expressed another way, compared with a solo rider you will get one hour of progress down the road “free” with every two hours you put in. 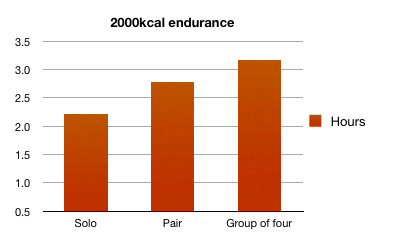 The graph above shows the endurance duration of a rider in different scenarios; I chose 2000kcal somewhat arbitrarily because it approximates how much glycogen your body stores in muscles and liver. “Buy two, get one free” is a huge advantage over long distances. While no cyclist needs to be told that drafting works, it is interesting to see by just how much! I haven’t yet had the chance to collect decent data on pulling versus sitting in a group on a recumbent. However, I do find it interesting that when I tested the RaptoBike midracer against my road bike I found approximately a 100W aero advantage at these speeds (150W giving 19.4mph recumbent, where 250W gave 19.6mph upright). Have you tried dropping your data for this ride into Golden Cheetah? You can often see the sections where you’re pulling as “virtual” climbs.